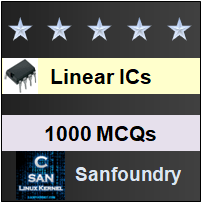 This set of Linear Integrated Circuit Multiple Choice Questions & Answers (MCQs) focuses on “Block Diagram Representation of Feedback Configurations”. Explanation: A feedback amplifier is sometimes referred as a closed loop amplifier because the feedback forms a closed loop between input and the output. 2. How many types of configuration are available for feedback amplifier? Explanation: There are four type of configuration are available. They are voltage series feedback, voltage shunt feedback, Current series feedback and Current shunt feedback. 3. Which of the following is not a feedback configuration? Explanation: In a feedback amplifier, either current or voltage can be fed back to the input, but both current and voltage cannot be feedback simultaneously. Explanation: In current-series and current-shunt feedback circuit, the load current flows into the feedback circuit. 5. Find the voltage-series feedback amplifier from the given diagram? Explanation: The mentioned diagram is the voltage-series feedback amplifier because the voltage across load resistor is the input voltage to the feedback circuit. 6. On what criteria does the feedback amplifier are classified? Explanation: The feedback amplifiers are classified according to whether the voltage or current is fed back to the input in series or in parallel. 8. Select the specifications that implies the inverting amplifier? Explanation: In inverting amplifier, the input is applied to the inverting terminal and the non-inverting terminal is grounded. So,the input applied to inverting amplifier can be V1 = 0v, V2 = 5v.